What were we thinking? On Monday, December 30th my wife and I woke up and decided to take our seven and nine year old daughters to Disneyland for a day of family fun. It was a decision that we soon came to deeply regret. The "Magic Kingdom" of my childhood has become a crowd-swamped purgatory where snaking lines of zombies text and tweet on their smartphones while their kids fiddle with hand-held Nintendo games. There isn't much else to do while waiting two hours for a five minute theme ride. Instead of showing our kids a wholesome good time we ended our day at the "Happiest Place on Earth" feeling stressed out and ripped off. Just how bad was our visit? After six hours and just three rides our kids were ready -- even relieved -- to leave early, although the crowds waiting for a parade made it nearly impossible for us to get to the exit. When your kids want to leave Disneyland early something is very, very wrong. Disney's corporate plutocrats have revenue-fracked the park's magic into a river of cash: the overcrowding of Disneyland creates a soul-crushing nightmare for visitors while enriching Disney shareholders and upper management. Does anyone care that the park's reputation -- built up over decades and generations -- is being permanently damaged? My seven year old was skipping with joy as we left the Mickey Mouse parking structure to get on the tram to the park. She stayed patient as we waited over twenty minutes to pay for our admission -- prices went up this June -- $356 for two adults and two children for a one-day/one-park pass. In an effort to speed up revenue collection, Disneyland does offer web-based payment for admission via smartphone, but we found the site impossible to read and operate in the bright sunlight. By the time we found ourselves on Main Street the kids were hungry so we stopped at the Mary Poppins themed "Jolly Holiday Bakery and Café" for a quick lunch. The food was good but there were no tables available. I eventually found a covered trash receptacle we could rest our tray on, and the girls ate on a park bench. We left expectantly, weaving our way through the gathering crowd towards the Pirates of the Caribbean. It was a bit of a challenge finding the end of the line for "Pirates" but eventually we spotted a frantic Disney cast member holding a sign and we slogged our way towards her as she raced to keep up with the end of the rapidly expanding queue. An hour later as we exited the ride we found ourselves in an almost impassable throng. As we battled our way towards the line for the Haunted Mansion I made brief eye contact with a disabled woman on an electric scooter who was inching through the crowd with a mouse-eared child in her lap: her face was tense with an expression of extreme determination mixed with terror that was quite a bit more frightening than anything I saw in the "Haunted Mansion." Being at Disneyland on a crowded day is a claustrophobic, shoulder-to-shoulder experience that is both anxiety producing and unsafe. I hadn't been at the park more than two hours before I wanted to leave but having paid a giant price for admission makes it very, very hard to walk away: its not like the old days when you could leave after tearing a few E tickets out of your booklet and come back another time. I won't bore you with the details of the rest of our day: just think crowds and lines and you can complete the picture yourself. One thing that struck me as we held hands and waded through the park is that Disneyland continues to be very well managed in most respects. During our visit the major rides were up and running smoothly, Disney staffers knocked themselves out to be friendly and helpful, and the park was squeaky clean. I found myself feeling very sorry for Disneyland's harried employees. After waiting 15 minutes in line to use the women's restroom my nine year old told me she wanted to see what the line was like at the Matterhorn. We never did find the end of the line, but when we saw that it continued past a sign indicating a wait time of 110 minutes my girls were crestfallen: they left the park without even asking for souvenir mouse-ears. The visit had cost our family of four more than $100 for each attraction we visited. 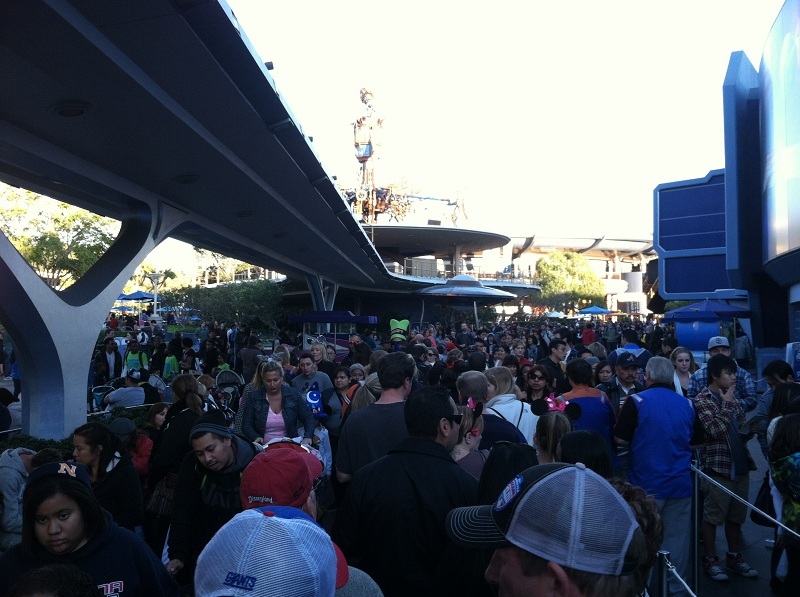 Our Disneyland experience was ruined by a failure on the part of Disney management: its failure to limit overcrowding. 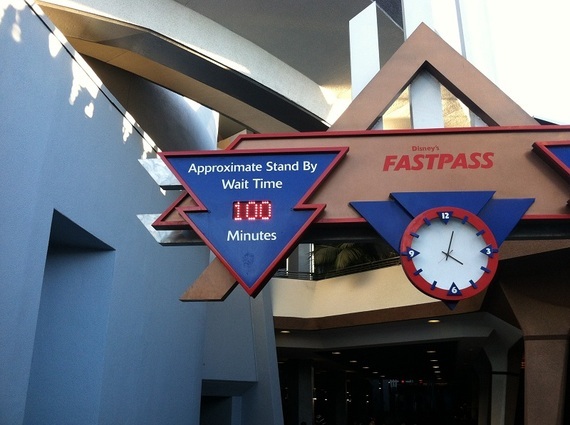 Despite record theme park revenues, Disney management has opted for revenue over their visitor's experience. If you think that "Fast-Passes" are the solution think again: none were available during our visit, and most rides had wait times similar to those posted in the photo below taken in December of 2012. Of course, by the time you have seen a sign like this one you have already paid and are inside the park. Disney should make this kind of information easily available to visitors before they enter. If you think it should be a potential visitor's responsibility to check crowd levels using third party apps and sites before entering the park I would reply that Disneyland should never be as crowded as it was on December 30th. 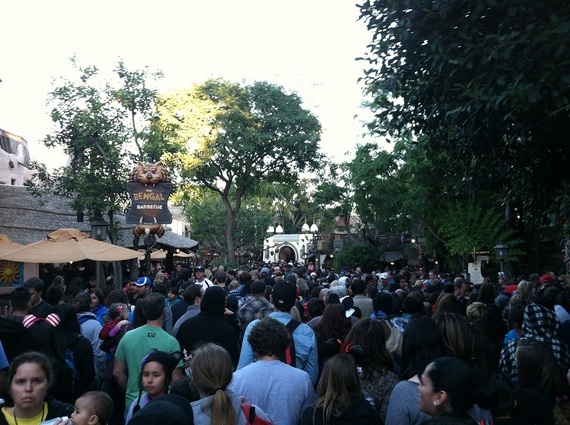 So, just how many people does it take for Disneyland to be overcrowded? Although it is hard to find precise information on Disneyland's capacity, it is widely believed that ticket sales are halted at 75,000 and that the park's front turnstiles are closed after 80,000 visitors have entered the park. 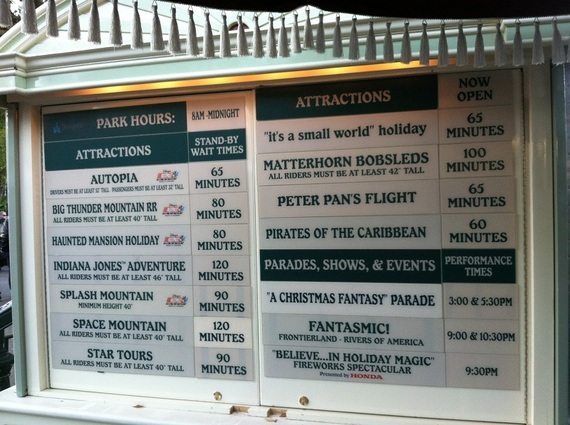 In December of 2010, the park reportedly turned away visitors for two days in a row when an estimated total of up to 100,000 visitors jammed Disneyland and its sister park "California Adventure." Why isn't the Fire Marshall shutting the place down from time to time? Each visitor represents a nice chunk of revenue - an adult one-day pass costs $92 and kids cost $86 - so it is easy to understand management's hesitation to limit crowds. Walt Disney and his brother Roy ponied up $17 million dollars of personal funds to build and open Disneyland in 1955 - a risky investment at the time - but park can now generates that much gross revenue for the Disney Corporation in two or three busy days. Theme park revenue has been soaring in recent years: in its recent fiscal fourth quarter Disney's worldwide network of theme parks and resorts reported an operating income of $571 million dollars, up 15% from the previous year. Iger said the Magic Kingdom, the world's busiest theme park, set a single-day attendance record during this year's Easter period thanks to interest in the new Fantasyland attractions. He said the extra breathing room created by the expansion, which will continue through this year, has sent guest-satisfaction ratings "way up" in the chronically congested park. Disney continues to test elements of MyMagic+, the technology that will outfit guests with wireless wristbands functioning as all-in-one park passes, hotel keys and credit cards, and allowing them to book ride times before leaving on vacation. Will Disney's new electronic bracelet genuinely improve the experience of park visitors? Disney Chief Financial Officer Jay Rasulo told the Sentintel: "If we can get people to plan their vacation before they leave home, we know that we get more time with them, we get a bigger share of their wallet." Mr. Rasulo, by the way, earned over $12 million dollars in compensation in 2012. If I had my way, Mr. Rasulo and the Disney Corporation wouldn't have another chance to get anything from my wallet, but later this year my 15 year old and her High School choir mates have been "invited" to perform at Disneyland and pay the full admission price for the privilege. I will end up paying her tab knowing that Disneyland is the overcrowded theme park that took the skip out of her younger sister's step.